Ava Gardner was another fascinating screen presonality to emerge after World War II. Possessed with a great arua which could run the range from intensly likeable to wildly angry, her range of emotions attracted many directors, who wanted what she could bring to their films. 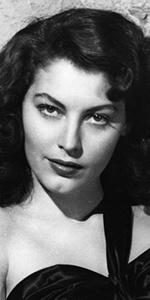 Ava Gardner was the youngest of seven children born to her cotton and tobacco farming parents, who were poor. At age seven, the Gardner's lost their farm, moving the family to Newport News, Virginia, where her father worked in the shipyards, contracting and dying from bronchitis when Ava was 15. Mother Mollie moved the family to Rock Ridge, North Carolina, where Ava graduated high school, and attended college for a year. Visiting her sister Beatrice in New York City in 1941, Ava's brother-in-law, a photographer named Larry Tarr, hung his portraits of the moody teenager in his shop window. A lawyer for Loews Theatres saw the portraits and suggested to the Tarr's that they should send Ava to M-G-M for a screen test. A test was shot in New York, and when studio head Louis B. Mayer saw it, he telegrammed back, "She can't sing, she can't act, she can't talk — She's terrific!" Garner was shipped to Los Angeles, where M-G-M vocal coaches went to work, trying to reduce the young girl's thick southern drawl. Garnder went through a five-year period of appearing in bit parts and shall roles in M-G-M films, like: Shadow of the Thin Man (which played the Chinese in November, 1941), Calling Dr. Gillespie (played the Chinese in August, 1942), and Masie Goes to Reno (played in October, 1944). During this time, she met and married M-G-M star Mickey Rooney in 1942, but divorced him in 1943. She married bandleader Artie Shaw in 1945, divorcing him in 1946. It wasn't until the post-war film-noir of writer Ernest Hemingway's short story The Killers (released in August, 1946), that Gardner became noticed for her turn as a double-crossing nightclub singer. Suddenly, Gardner was a hot item. She then worked with no less than Clark Gable and Deborah Kerr in The Hucksters (released in August, 1947), and starred as Julie LaVerne in the remake of Show Boat (released in 1951). After filming Mogambo (released in October, 1953), she had an opinion of her director on the picture, John Ford, which was similar to Mayer's assessment of her screen test: "(he was) the meanest man on earth. Thoroughly evil. Adorded him!" Gardner played Guinevere to Robert Taylor's Lancelot in Knights of the Round Table (released in January, 1954), while a signature role is her Maria Vargas opposite Humphrey Bogart's Harry Dawes in The Barefoot Contessa (released in September, 1954), and she starred for director George Cukor finally in Bhowani Junction (released in May, 1956). Given her friendship with Hemingway, it was only natural that Gardner would star opposite Tyrone Power in the film version of his novel, The Sun Also Rises (which played the Chinese in August, 1957). After her divorce from Sinatra that same year, Gardner spent more time in Hemingway's orbit, buying a house in Spain and becoming an avid fan of bullfighting. 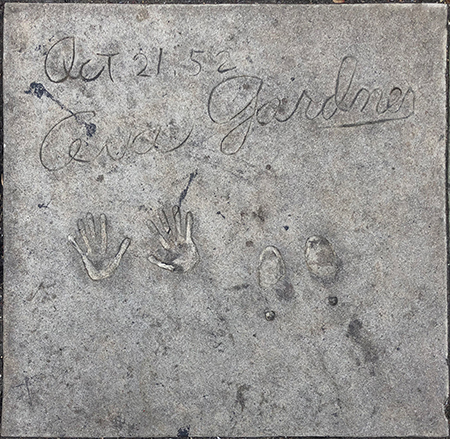 Another signature role came for Gardner to take on the role created by Bette Davis on stage as the free-wheeling but secretly fragile Maxine Faulk in The Night of the Iguana (released in August, 1964). She enjoyed working with director John Huston so much that she accepted the role of Sarah, wife of Abraham (played by George C. Scott), in The Bible . . . In the Beginning (released in September, 1966). Moving to London in 1968, she appeared as Empress Elisabeth of Austria opposite James Mason's Emperor Franz Joseph I in Mayerling (released in October, 1968). She took part in the international production of The Cassandra Crossing (released in February, 1976), and co-starred as Luxury with Elizabeth Taylor in The Blue Bird (released in April, 1976). Her last film was Regina Roma (direct to video in 1982). Gardner did little television, but here is a complete rundown: She played Agrippina the Younger to Richard Kiley's Claudius in A. D. in 1985; guest starred as Ruth Galveston in Knots Landing on CBS in 1985; played Minnie in a mini-series remake of The Long, Hot Summer on ABC in 1985. She appeared as Omar Sharif's "head wife" in the television movie Harem broadcast in February, 1986, and had a supporting role with Stephanie Powers in the title role of Maggie, broadcast in July, 1986. Two strokes in late 1986 left her bedridden. Gardner's autobiography, Ava: My Story was published just after her death from emphysema and pneumonia, brought on by a lifetime of smoking, in 1990. She was 67. Grauman's Chinese Theatre, Hollywood, California. Ava Gardner Forecourt ceremony, Tuesday, October 21, 1952. 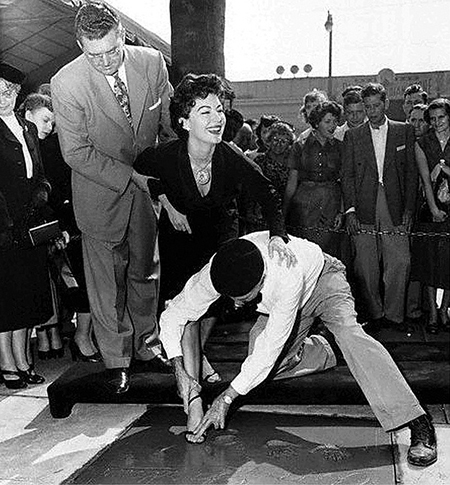 Chinese Theatre manager Ralph Hathaway assists Ava Gardner as cement artist Jean Klossner makes the imprint of Gardner's shoe.